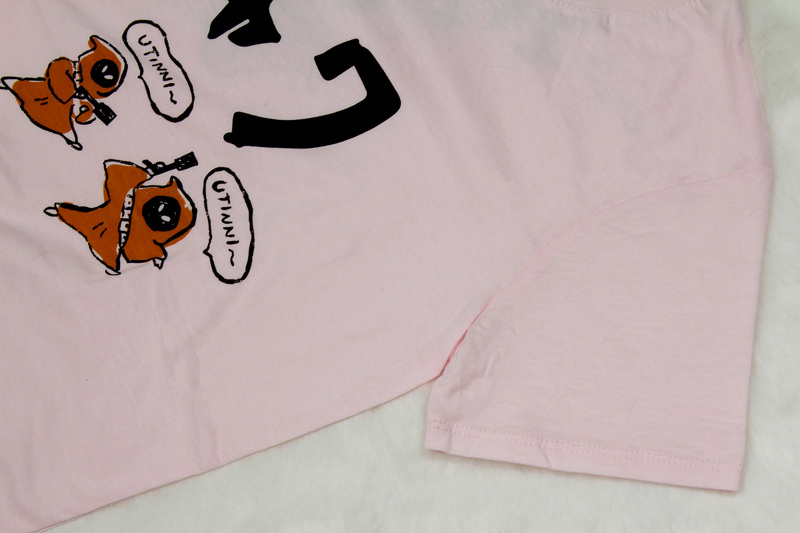 Today’s review features the women’s Star Wars Jawa t-shirt from Cotton On. 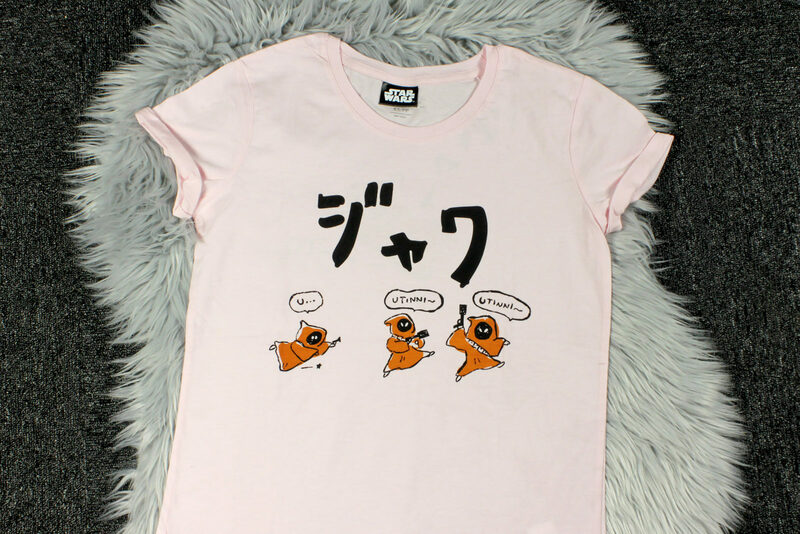 This t-shirt is part of a Japanese themed Star Wars collection by Cotton On, which includes four t-shirt designs – Jawas, Ewoks, Yoda, and Star Wars text. 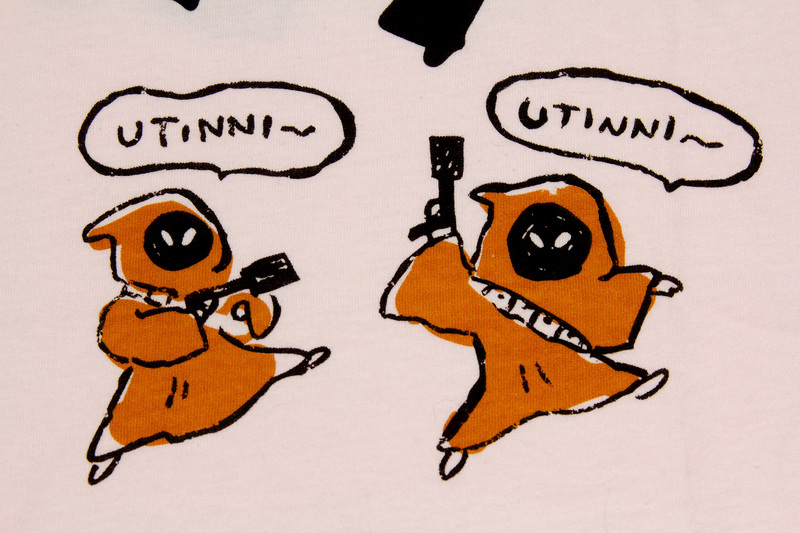 I love the cute artwork for the jawa t-shirt, I just had to track it down for myself! The t-shirt is available in varied sizes and prices, depending on current website stock, in-store stock, and country – Cotton On stores ship within their own countries (if Cotton On is not based in your country, international customers can order from the US via a mail forwarding service). 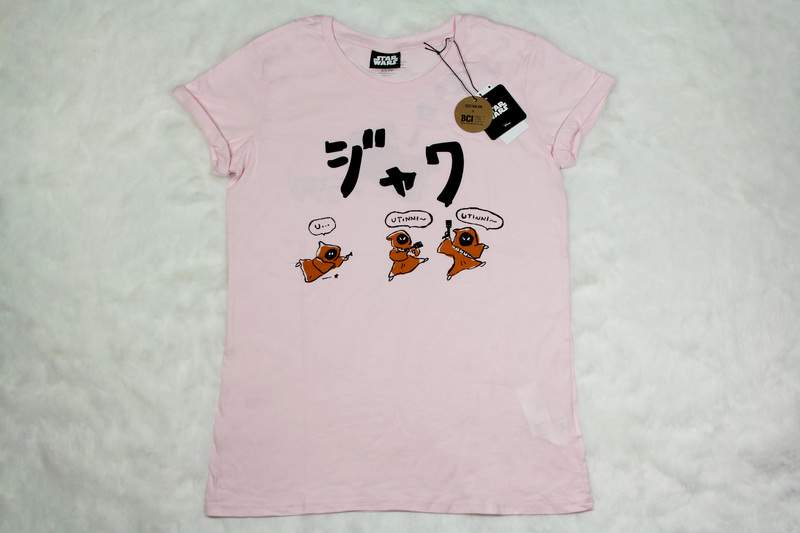 The front of the t-shirt features hand drawn-style artwork of three jawas, beneath Japanese text. 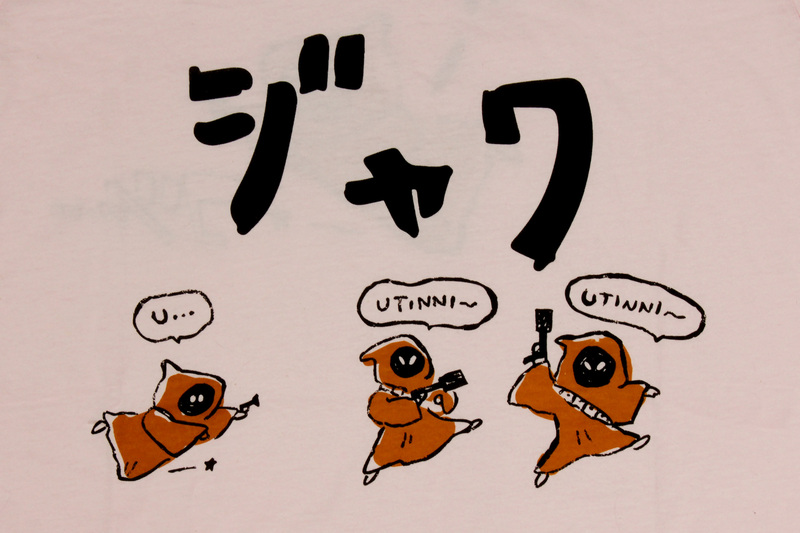 As best as I can tell, the Japanese text says ‘Jawa’. Each Jawa has a small speech bubble above them – two are saying the classic jawa word (phrase?) of ‘Utinni’, while a third one is cut short while tripping up. The artwork is done in black line art, with a ‘roughly coloured in’ area of brown. The t-shirt neckline is finished in the usual way, with a strip of ribbing and top stitched. The sizing information (in this case ‘XS/PP’) is printed in silver foil at the inner back neckline, along with the text ‘The Relaxed Tee’ – which I assume describes the fit. 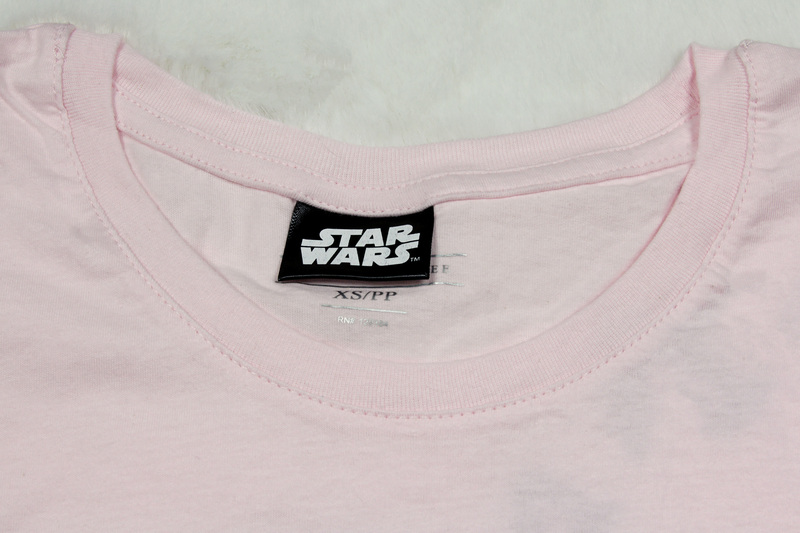 A black fabric tag is also sewn into the inner back neckline, which is printed with a classic ‘Star Wars’ logo on the front, and ‘© & ™ Lucasfim Ltd.’ on the back, noting this is a licensed item. The garment care tag is sewn in the lower inside left side seam. As Cotton On sells in many countries, the care instructions are printed in several languages, resulting in a rather long tag – there is a dotted line printed at the top, so it is assumed customers will want to cut out/remove this for comfort. This t-shirt is a size XS – it measures approximately 45cm across the chest (underarm to underarm), 48cm across the lower hem (side seam to side seam), and 55.5cm from front neckline to front lower hem. It is not a particularly fitted shape, it is more of a relaxed fit, as the printing at the inner neckline indicates. The inside seams are overlocked (serged), and the lower hem is also overlocked (serged) and turned over, giving the t-shirt a nice finished look. 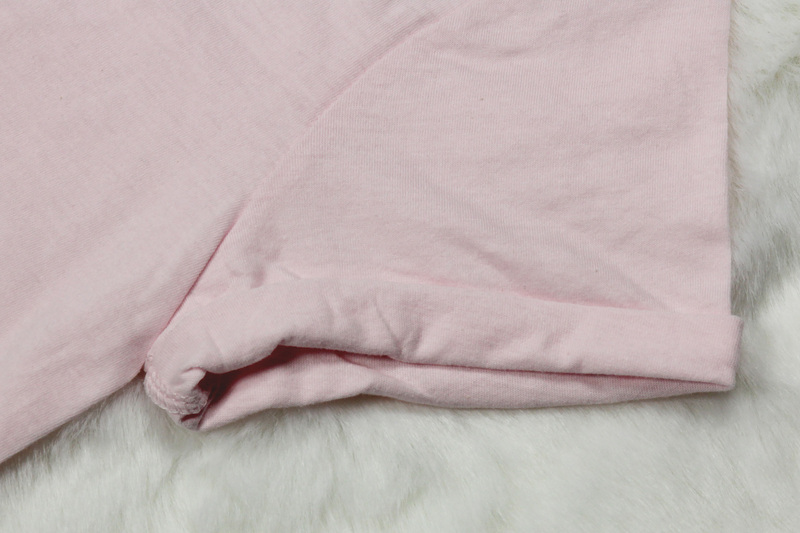 The short sleeves have a rolled hem, in a ‘boyfriend tee’ style. Upon closer inspection (that is, I was curious and unrolled the hem), I found these are sewn in a regular t-shirt sleeve style, then rolled. The Cotton On website photos show the sleeves rolled, and this was how the t-shirts were all displayed in store – I was expecting that the sleeve edges would be raw, as I have found with other rolled sleeve t-shirts. I am happy that the sleeve edges are hemmed, as you can keep the sleeves rolled shorter or straighten them out longer depending on your preference or outfit style. Now, on to the back – it features a print as well! This is the only t-shirt in the four-piece collection that features a print on the back, so it really stood out to me. 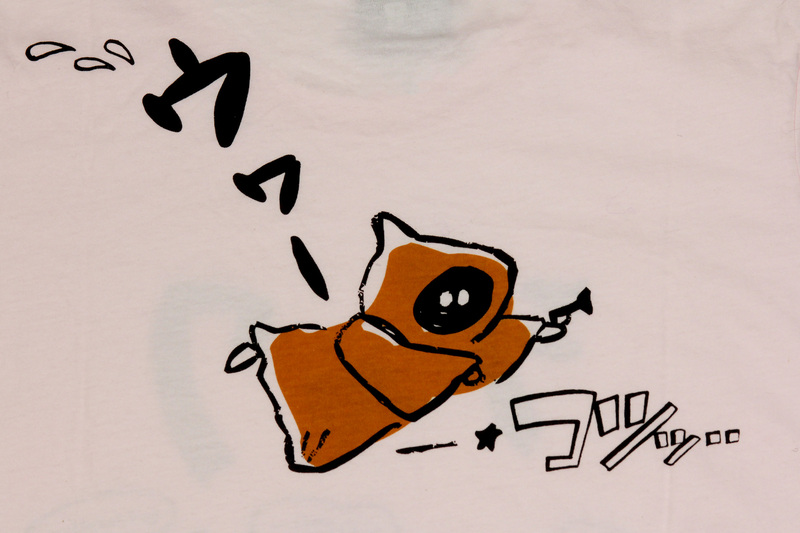 The back artwork features a single jawa, tripping up like the one on the front – though I’m afraid I don’t know what the Japanese text here says (it appears to be an exclamation of sorts?). It is rather uncommon for women’s Star Wars t-shirts to feature printing on both the back and front – perhaps this is because many women have hair longer than shoulder length, which would cover back artwork when worn down. For a print this cute, I’ll gladly wear my hair up just to show it off! Also, printing on both sides usually costs more than just on the front, which in turn results in a higher price point for customers – I was happy to see this double-print t-shirt cost the same as the other single-print t-shirts in the collection.